Happy Friday! Its Design Team day again over at Pink Cricut! For today's project I used March's stamp of the month set. I just LOVE the watering cans and flowers in this one so I decided to focus on the watering cans. First I stamped the solid watering can in a light pink and then stamped over it with the other watering can in either a mauve or brown. Then I added a green stem and some flowers coming out of the top. I used my spellbinders to cut out the watering cans in squares then inked the edges in a light brown. I really wanted to make the watering cans the focus of this card so I decided not to add any sentiments to the outside of the card. Instead I stamped "Thanks a Bunch" to the inside. Thanks for checking out today's Design Team post. 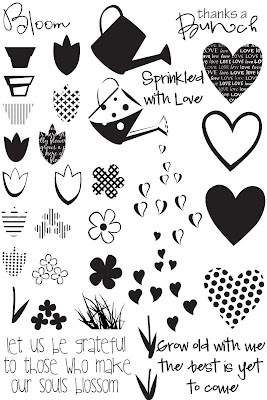 Make sure to check out Pink Cricut for the other projects made with this stamp set!! So cute!!! I can't wait till I get my set! very cute girlfriend, love the colors !! !